SafeList Advertising WORKS THE BEST -- But Only When Done The RIGHT Way! Below Are 5 Free Videos Showing How To Do SafeListing Step By Step - The "Ultimate SafeList Survival Guide" We Do Not Own And Must Charge For It - The Videos Are Free To Watch Or Save! If you are new to SafeLists then please watch these videos. They are not long and explain very clearly on how to get your ad out and utilize SafeLists to their fullest. Click on the below links to watch the videos. Right click on link to "Save to Disk" on your computer (This is recommended for dialup ISP accounts). 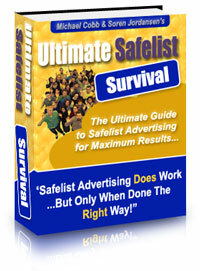 The Ultimate SafeList Survival Guide - Discover The Little Known Secrets Of Generating Free Leads And Traffic From SafeLists! Michael Cobb and Soren Jordansen lead you step-by-step through the Insider Techniques To Effective SafeList Advertising. Please note: Some people have been having problems with viewing the videos. The files are Windows Media Viewer files and should be viewed with Windows Media Viewer which can be downloaded free directly from Microsoft. Click Here to get it now. Also if you receive a "Codec Error" please Click Here to download and install Codec's. This program will install virtually all the codecs needed to play any type of file supported by the Windows Media Viewer. We hope this material will benefit you to the greatest in learning how to use SafeLists properly and effectively.